"The serpent, the king, the tiger, the stinging wasp, the small child, the dog owned by other people, and the fool: these seven ought not to be awakened from sleep. 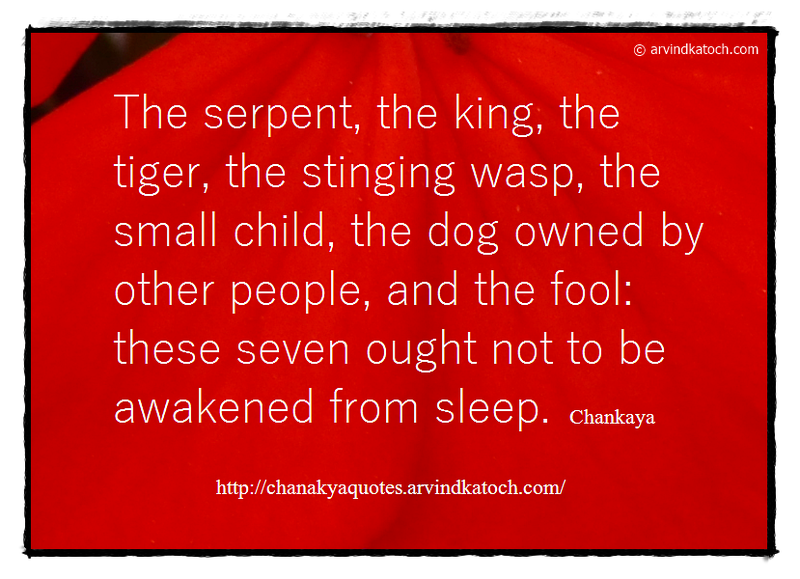 Chanakya"
Chanakya Wise Quote Meaning/Explained- In this Quote, Chanakya is sharing his wisdom that we should never awake from sleep the serpent, the king, the tiger, the stinging wasp, the small child, the dog of others and a fool because they can either harm us or may cause us discomfort. For example, a serpent awakened from sleep can bite us and us causing us injury. While a small child awaken from sleep can start weeping thus causing discomfort.